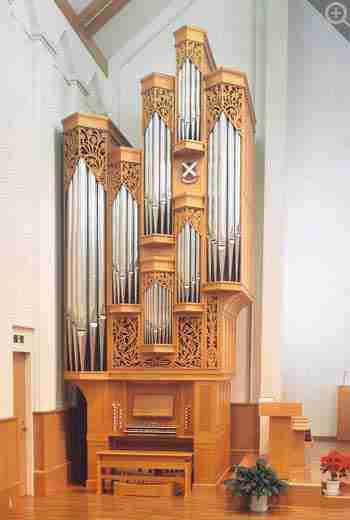 The first organ to be exported from Britain to Japan was the 26-stop Abbott and Smith Instrument delivered in 1920. Until quite recently, it remained not only the largest English organ in Japan but almost the only one. 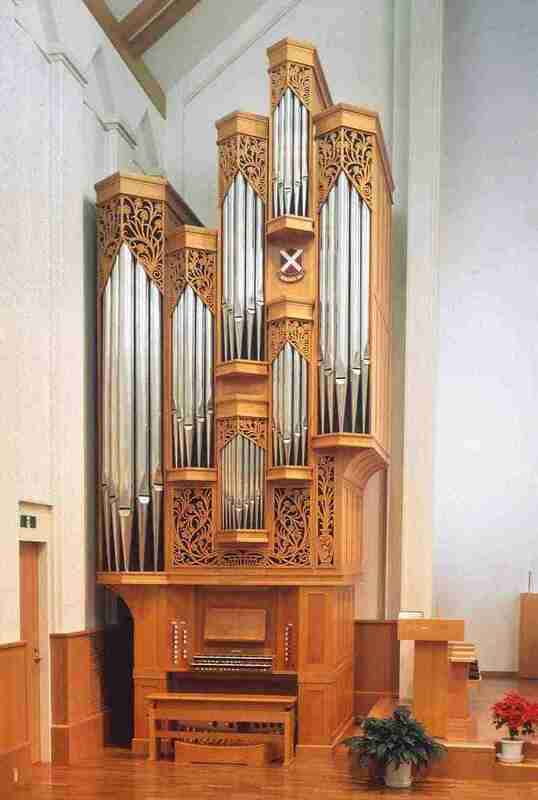 In 1990 it was joined by the organ for the chapel of St Andrew's University which, in spite of its modest 16 stops, was the largest British organ sent to Japan since the Abbott and Smith. It has mechanical action and is housed in an interesting asymmetrical case. Less than five years after its installation, St Andrew's University moved to an entirely new campus, designing and building a new chapel around the design of the organ. The two most significant items taken from the old campus to the new were the pipe organ and a 40ft tall oak tree. As the organ was to be placed on one side of the chancel, this presented a challenge: to produce a pleasing and balanced but asymmetrical case design. Although modern in its execution, traditional values of proportion and design were retained. The carving in the front of the case was specifically designed to give an oriental feel to the instrument. The key action is suspended, the manual departments disposed one above the other, and the temperament used is Vallotti.